The latest Dyson Cyclone Cordless Stick Vacuum is here with us – the Dyson V11. What are the new features? How is it different from the V10, V8, V7, and V6? In this article, we delve deep into the Dyson V11 review in terms of the features, specifications, pros, and cons. We’ll also compare the two current variants – the Dyson V11 Animal and the Dyson V11 Torque Head. In this section, we look at the general features and capabilities of the Dyson V11. We will compare the Dyson Animal and Torque Drive later on. Dysons are famous for being very powerful. The same applies to Dyson V11. This model uses the Dyson digital motor V11. The motor spins at 125,000 RPM and in the process, generates 20 percent more suction than the V10. Also, 14 concentric cyclones generate a very huge force that pulls in even the tiniest particles. So, pollutants such as pollen and dust cannot match the Dyson V11. It is well known that most Dysons are great on all types of flooring. The Dyson V11 goes a step further. DLS technology automatically changes the motor speed as you transition from carpets to hard floors and vice versa. It does so by detecting the roller brush resistance as you clean. This way you will automatically have just the right suction for the respective floor type you’re cleaning. A good design should not only be focused on aesthetics. Of course, the Dyson V11 is pleasing to the eye. But more importantly, the design is also focused on making the cordless stick vacuum more efficient and easy to use. First, it is acoustically designed. This helps to reduce the maximum noise level. Granted, all vacuums are loud, but if you can get one which is slightly quiet, you should go for it. Then, the motor, the dirt bin, and the cyclones are aligned. 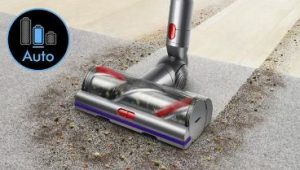 This straight-line design helps to boost the suction because air + dirt are sucked into the vacuum in a straight line. 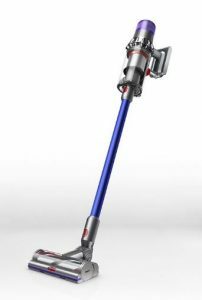 The Dyson V11 uses a High Torque cleaner head to clean both hard and carpeted floors. Stiff bristles take care of deeply embedded dirt while soft carbon fiber filaments are for hard floors, cracks, and crevices. The soft filaments are ideal for the finer dirt and dust particles. The Dyson V11 has three cleaning modes – Auto, Boost, and Eco. First, the Auto mode automatically adjusts suction as you move from carpets to hard floors. Secondly, the Eco mode allows you to clean for a long time by reducing power consumption. Lastly, the Boost mode increases the suction so that you can tackle any deeply embedded dirt. Of course, the runtime is going to be reduced in Boost mode. Unlike previous Dyson Cyclone models such as the V8 and V10, the Dyson V11 has an LCD screen that displays various things. Apart from the mode you have selected, it also shows how much time is remaining before the battery runs out. Also, for optimal performance and prevention of damage to the vacuum, it displays maintenance-related alerts. For example, it lets you know when to clean filters. In case there is any blockage, the information is displayed on the screen. This way, you never have to replace filters or other parts before the expected lifespan is reached. 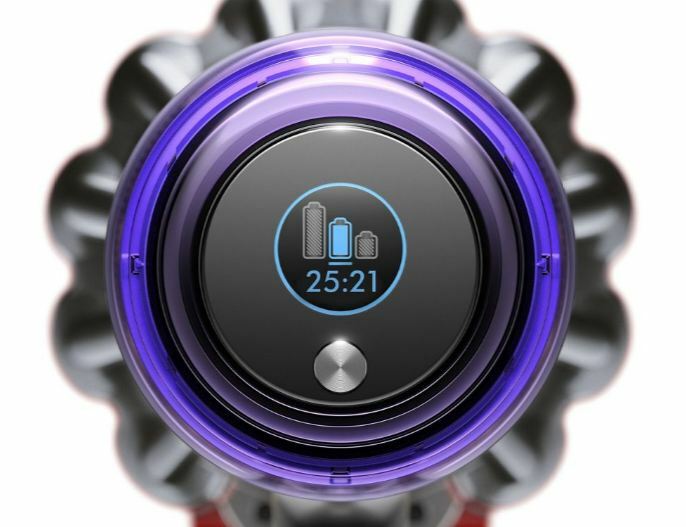 The Dyson V11 Animal has an LED screen while the Dyson V11 Torque Drive has an LCD screen. Filtration is a critical part of a vacuum – especially if you are fighting allergies. Also, anyone suffering from respiratory diseases like asthma must be keen to get a vacuum with a good filtration system. The Dyson V11 uses an advanced whole machine filtration system. Consequently, allergens as small as 0.3 microns in diameter are trapped inside the dirt bin. This filtration system is HEPA standard because HEPA filters also capture particles as little as 0.3 microns (diameter). When compared to the previous models in the V series, it has a larger battery with a higher capacity. This translates to about 20 percent more suction power than the immediate predecessor – the Dyson Cyclone V10. The battery also ensures that the suction remains constant from start to finish. This is pretty straightforward. There is no particular improvement since you get a wall mount that is also available for previous models. The wall mount doubles up as a charging dock and a convenient storage space for the vacuum. The Dyson V11 vacuum has quite a number of attachments that are useful for above-floor cleaning. The Dyson V11 Torque drive comes with a mini motorized tool, a combination tool, a crevice tool, a mini soft dusting brush, and a stubborn dirt brush. On the other hand, the Dyson V11 Animal has a mini motorized tool, a combination tool, a crevice tool, and a stubborn dirt brush. Click here to see the current price of the Dyson V11 Torque Drive. The two Dyson V11 iterations are basically the same. There are very few differences. As mentioned above, the Torque drive has one more attachment. Then, the Dyson V11 Animal is slightly shorter. Weight 6.68 lbs. 6.68 lbs. Like any other vacuum, the Dyson V11 is not perfect. There are so many positives, but also a few negatives. Let’s look at the Dyson V11 Pros & Cons. Well, first of all, Dyson stick vacuums are the most expensive in the market. However, they are also among the most powerful and efficient stick vacs. Also, they are great at picking up all kinds of dirt and debris (including pet hair). So, if you can afford the Dyson V11, you should definitely buy it. The vacuum is more powerful than the previous V series models. A huge plus is the LCD/LED display that lets you know which mode you’re using and the status of the battery and/or filters. You won’t find a more advanced stick vacuum in the market this year. Lastly, the fact that it adjusts the suction automatically depending on the surface is a great selling point. That is a rarity in the stick vacuum space.